This online guide is dedicated to Kenneth E. and Dorothy V. Hill, in appreciation of their role in developing the ornithology rare book collection at Cornell University. Through the Hills' generosity and enthusiasm the ornithological collections in Cornell University Library have been enriched substantially and will continue to be enriched for generations to come. 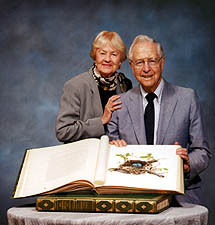 In the mid-1980s, Mr. and Mrs. Hill gave more than 100 of their personal copies of rare and handsome bird books to Cornell. In the years since they have shared with the library in purchasing additional important historical ornithological titles. The Hills also created an endowment that provides regular income to buy additional books for the Hill Ornithology Collection, and a research endowment which also has made possible the development of this Web site. In appreciation of their generosity, Cornell University named the library's collection of rare ornithology books in their honor. The influence of the Hills, however, extends far beyond these specific contributions. Stimulated by their interest and support, the Library has intensified its efforts to strengthen the ornithological collections. This has been particularly significant in expanding the rare book collection, where earlier funding had not permitted a degree of attention comparable to that applied to the systematic acquistion of current research materials in ornithology. Word of this increased activity has spread, prompting others to give additional rare ornithology books to Cornell. To Kenneth and Dorothy Hill we affectionately dedicate this guide and Web site. Cornell University Library cherishes them as friends and benefactors. Future generations of students and researchers will have good reason to do the same.